The Queen's Baton of the 2014 Glasgow Commonwealth Games was taken at the historic India Gate by the country's top sportspersons in a low-key event on the first day of its India stop on Saturday. It was more of a photo-op event as the Baton was brought by Commonwealth Games Federation Secretary and 2014 Glasgow CWG Vice-Chair Louise Martin at the Major Dhyan Chand Stadium here before being taken to the India Gate. Sportspersons who held the Baton were discus thrower Krishna Poonia, shooter Samresh Jung, weightlifter Kutulu Ravi Kumar, wrestlers Yogeshwar Dutt, Amit Kumar, Anil Kumar and Anita Tomar and hockey players P R Sreejesh, V R Raghunath, A V Sunil and Birendra Lakra. Indian Olympic Association senior officials G S Mander, S Reghunathan and R K Gupta received the visiting delegation. Youth Affairs Secretary Rajiv Gupta, who is also looking after the Sports Department as an additional charge, and SAI Director General Jiji Thomson were also present. Reghunathan said President Pranab Mukherjee was to host the Baton at the Rashtrapati Bhavan but cancelled the event due to prior engagements. "The President of India was to host the Baton at Rashtrapati Bhavan today but he is arriving in Delhi late in the evening after some engagement, so it was cancelled. Then we sent invite to the Sports Ministry to send some representative if not the Minister himself," he said. Martin said India was not the country where the Queen's Baton was not being taken in a relay by sportspersons. "Even in Scotland, the host country, it was more of taking the Baton at Community Centres and historic places rather than taking in a relay. We want as many sportspersons come out and hold the Baton," she said. India is the first international stoppage for the Baton as under protocol it will have to be taken to the country which hosted the previous Games. The Baton, which carries Queen Elizabeth II's message to the Commonwealth, landed on Friday night and was taken to Agra in the morning, where it was received by Uttar Pradesh Olympic Association officials at the Taj Mahal. "The Baton was received by Yadav and me and then handed over to Asian Games gold medallist 3000m steeplechase runner Sudha Singh. The Baton remained at the Taj for around an hour and then taken to the Agra Fort before heading for Delhi at 12:30pm," Pandey said. On Sunday, the UNICEF will hold a programme in the morning and after that, the Baton will be taken to Qutub Minar by the athletes and IOA officials in the afternoon. The Baton will leave Delhi for Dhaka on the morning of October 14. 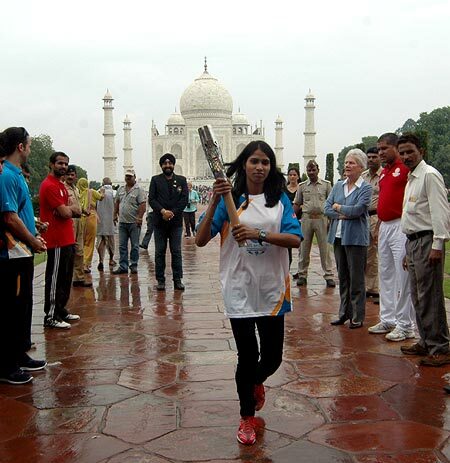 Image: Indian athlete Sudha Singh holds the Commonwealth Games Baton as she runs in front of the historic Taj Mahal in Agra.